Kurt Barnhart is Professor and head of the Department of Aviation at Kansas State University. He’s also Executive Director of the Applied Aviation Research Center which focuses on integrating unmanned aerial systems into the national airspace system. 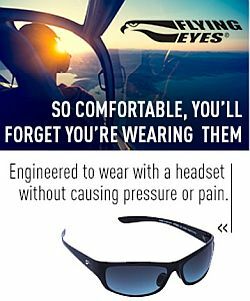 Kurt been a National Association of Flight Instructors’ Master Flight Instructor since 2003. In this week’s Australia Desk report: Virgin Australia re-branding completed, Polynesian Blue re-branded as Virgin Samoa, Sydney International Airport to upgrade & reconfigure its terminals, China Southern to increase its presence in Australia & is looking for a more Aussie feel to its services, Scoot looks to fly to Sydney from Singapore while it’s CEO has a possible Freudian slip when talking about the value of low cost carriers. Find more from Grant and Steve at the Plane Crazy Down Under podcast, and follow the show on Twitter at @pcdu. Steve’s at @stevevisscher and Grant at @falcon124. This week on Across the Pond, Pieter brings back Gareth Stringer and Tim Robinson for our monthly update on aviation news in Europe. Tim has visisted Dubai for the Airshow and brings back stories on Qatar Aiways and the fights with Airbus over the A350-1000 modifications. Gareth tells us about the next edition of Global Aviation Resource monthly digital aviation magazine and we discuss our favourite photo of 2011 on The Hangar. Find Gareth at www.globalaviationresource.com and Tim at www.aerosociety.com. 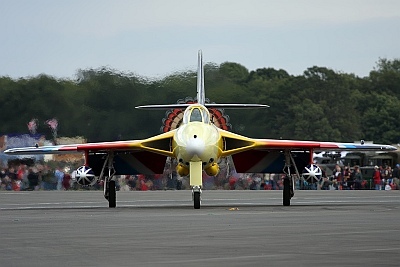 Post photo: ‘Miss Demeanour’ a Hawker Hunter that features in UK Airshows owned by Jonathon Whaley. Picture is Courtesy of Gareth Stringer and Global Aviation Resource.com. This entry was posted in Episodes and tagged American Airlines, FAA, Iran, Meigs, Pilot Jobs, supersonic, UAV on December 13, 2011 by maxflight. ELEPHANT EAR – An air intake characterized by twin inlets, one on each side of the fuselage, so the Elephants Arse is probably the part where the two inlets join…in otherwords the rear of the elephants ears! Is “Nonepass” the slang term used for Continental Airlines? it refers to the difficulty in redeeming award points. Hi Max, I remember something now about it, I think it was on the Vampire Jet. When I was doing my pilot training theory at Bankstown Airport (1985) in Australia, there was a Vampire Jet that we all had a talk about for the Engines, Systems and Instruments theory part. They were the good old days. If you look at the leading edge air intakes they are elephant shaped, as I remember, and they went to the elephants arse ! i.e the centrifugal jet engine…which everyone who knew about it, said it was truely an elephants arse to maintain. It was renowned for compressor stall during startup and a terrible lag time. Something makes me remember it had a Nene Jet engine which they (at the time) said had to be replaced by the Goblin Jet engine due to reliability problems. Hence the elephants arse! I have been out of the industry for 20 years now so my memory may not be a bit hazy! Alex: You’re still thinking in generally the right way, but not about the aircraft I have in mind! Stay warm in China! I remember some cold days in Beijing from years past! Max, Yes you have me stumped, but I am quite sure it is a centrifugal Jet aircraft, because the engines were renowned for being..an arse! (1950’s 60’s)!. I am sure it was the Vampire here in Australia, that had that name given to the Nene engine, but maybe it is one of the first Harrier Jump Jets….large intakes …going to a crap engine. I have to think about this more. Oh well, it would cost you too much to send me a button! With only 51 jumps from various aircraft (C-121, C-130, C-141, Casa 220, DC-3, UH-1, MH-60M, MH-47, Ch-47 to name a few), I found your comments on parachute operations as bias. Since many of you have never jumped from an aircraft while in flight you are not speaking from a knowledge base. SHAME. For some of us, it’s the only what we can fly. However, after all is said an done, I’m still a fan. Looking forward to the next year of Airplane Geekdom.